For a structure with multiple columns, beams, walls and slabs, the order placed first will be the one for columns. 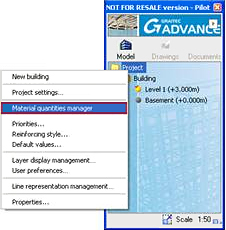 Select the "Material Quantities manager" option. The option is accessed from the "Advance Model" toolbar or by right clicking Project. 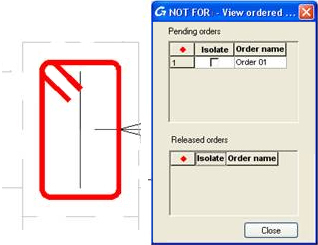 The window that appears contains all the orders placed so far. Select "New" to add a new order. Select "Add" for a new release of materials. In the properties window fill the required characteristics. 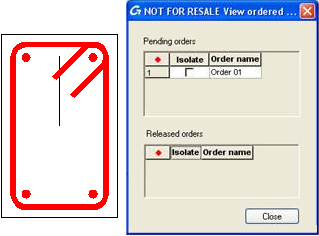 For this example in "Description" enter the name "Order01". Click OK and the order will be listed. You can add bars by clicking the "+/-" button. A new toolbar will appear. For this example we will select only the stirrup. Add it to the order by clicking . Once added, click "Finish". You will also notice that the color changes. For the bar to appear in the order click "Update". To view the bars that have been released from "Advance Tools" select "View released bar". If you check "Order 01" the bars that have been ordered will remain visible. This way the released materials will be easier to track.